Pete Seligman is a self-taught artist. He worked first as a teacher and later as copywriter in New York City publishing companies, an ad agency, and in The Library of Congress. Pete exhibited at the Library’s annual staff arts and crafts exhibition for 25 years and was Featured Artist in 2005. He also exhibited at the Rockville Arts Place (now VizArts) member shows. Now a full-time artist, Pete joined Foundry Gallery in October 2018. 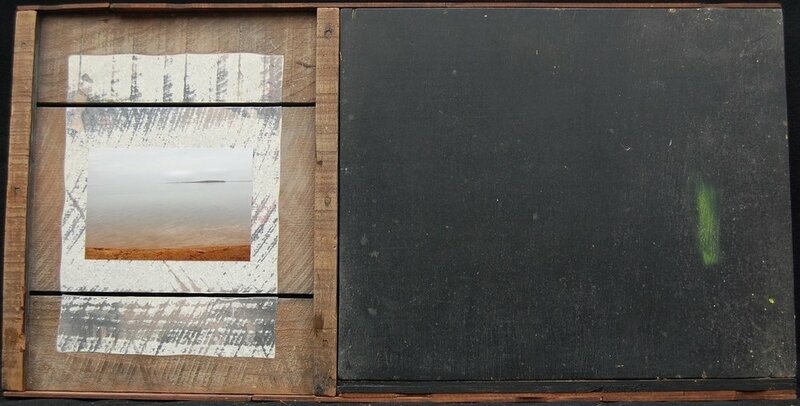 My works are primarily constructions made from wood with varying degrees of collage, paint, and found materials. A construction often starts from an earlier abandoned work that is only partially erased or scraped. From that initial accident I feel free to experiment with materials and media and see where that leads. The piece evolves in ways that surprise me. I walk around Washington, DC and hike along the banks of Rock Creek, also in DC, to find used and weathered wood and metal. Oil paint, lumber store wood, and collage are then added. Sometimes I cut words and phrases from newspapers and arrange them to communicate something that has not been thought out ahead of time. The text-added constructions suggest a narrative but do not quite tell a story. I don't have a story to tell when I begin and when it's done the story is not at all clear, but there seems to be a story lurking there somewhere.